Dursley's Market House is the centrepiece of the town, a symbol of its identity without which it would resemble many other small towns throughout the country. It stands at the junction of what are the town's three main trading streets, Parsonage Street, Long Street and Silver Street and dominates the view from all of them. In recent times these three have also been joined by Castle Street which carries traffic around the pedestrianised Parsonage Street. The Market House dates from Georgian times, being built in 1738 and entirely funded by the Estcourt family for the holding of regular markets and fairs conducted in, under or around the building. The building is of sturdy construction, being of typical covered appearance, standing on pillars with the Town Hall above, which is accessible via a staircase in the south-western corner. Originally the staircase was external to the building but caused such traffic jams of horses and carts that it was moved to its present position under cover. A Blindhouse, or jail for vagrants, was also situated under the old steps but this was removed along with the stairs. "To a Coat of Arms, carved at the Market House - £13.13.0"
"To the Statue of Queen Ann at Dursley - £22.00.0"
The Coat of Arms mentioned above is situated on the south side of the building and is often referred to as the "Estcourt Coat of Arms". The Arms were originally granted to "Thomas Estcourt of Shipton Moyne" in November 1606 and consist of a shield divided into quarters, the arms in the first and fourth quarters being those of the Estcourts and the second and third those of the Beauboys family with whom they intermarried in the early 15th century. Lordship came with the right to levy tolls on goods sold at the market but due to the difficulty in extracting them from some of the farmers, The Estcourt family decided to sell the Market House in 1841 to Henry Vizard and he then gave up his right to charge tolls to the people of Dursley which were to be managed by the Bailiff and Court Leet. The Court Leet was a manorial court which typically met once or twice a year for the overseeing of law and order. In 1894 the Court Leets and the Office of Bailiff were abolished and replaced by Parish Councils but the final act of the Court was to establish a charitable trust to look after the Market House and Town Hall in perpetuity. 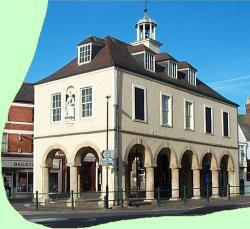 The Trustees of The Dursley Town Trust executed this task all the way through to 1996 after which its duty to look after the Market House was handed over to Dursley Town Council.